Distinguished by a new Venezia Blue livery and chrome details, the Tipo Mirror comes with UconnectTM 7″ HD LIVE touchscreen system, with Apple CarPlay integration and Android AutoTMcompatibility, as standard equipment. 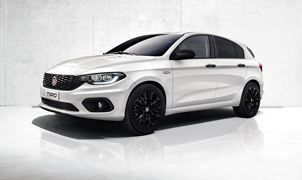 With its specific features and exclusive colour combinations, the Mirror special edition is the perfect combination of Tipo technology and style. Packed with these advanced capabilities, the car becomes the extension of the driver’s smartphone allowing access to the main applications on your device safely, directly from the driver’s seat and always keeping your hands on the wheel. Tipo Mirror is also style. The exclusive, new Venezia Blue livery, available on demand, makes its debut and perfectly sets off a host of alluring chrome details, such as doors handles, side mouldings, lower grille profile, fog light bezels and mirror caps. A special “Mirror” badge on the pillar and diamond-cut 16-inch alloy wheels complete look.